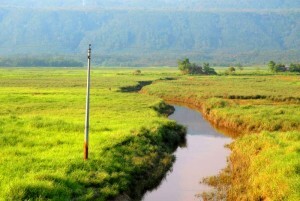 Gurr River, the actual name of this place is Nagar River, but popularly known by the locals as Gurr. 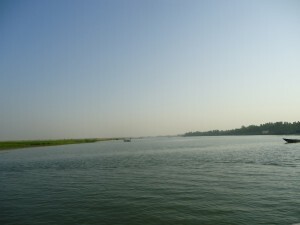 It is one of the beautiful rivers of Bangladesh. 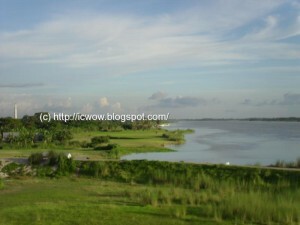 It is situated at Singra Upazila of Natore district near “Singra Upazila Health Complex”. It is very small but, looks very pleasant. There is a very large sized bill beside this river. The coordinate is 24° 30′ 54.43″ N 89° 8′ 42.75″ E. The Bridge was built years ago, the exact year was not found, but it’s really helping the people in establishing business connection on both sides of the river. After reaching at Natore Sadar, take local bus, CNG or Auto rickshaw to reach Singra Upazila Bazar. From there, take rickshaw or Auto rickshaw to reach that place. It is recommended to carry drinking water and dry foods all the time, as you may not find available food in all the places. Referred to where to eat at Natore Sadar, click here. Also, you need to look for local hotels to food for at Singra bazar. Tamabil is on the border front of Sylhet-Shillong road, Tamabil is surrounded by beautiful nature. It is about 55 km away from Sylhet town. The sight of mountains while traveling through the zigzag streets is an attraction for the tourists. The tide flowing from the mountains is a treat to watch for the eyes. It is located in the main town of Madaripur District. Most of the major districts are established around a river. Madaripur is not alike from those. This simple but beautiful district is found around the river "Arial Khan". Both of the banks are slapped by the almost overflowing water from the river. This river meandered the district all around and where ever you visit the district, you'll find the river or a branch of the river. 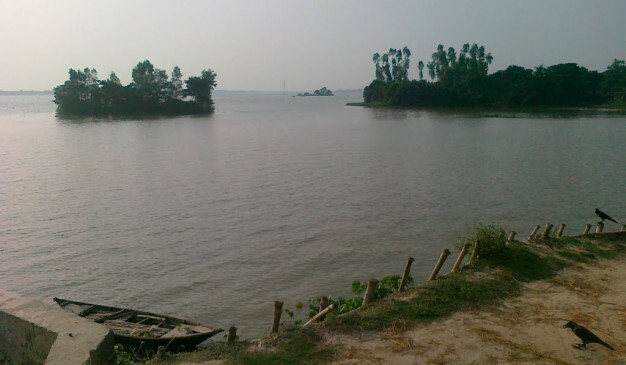 "Arial Khan" is originated from the River Padma, and flowed through several southern districts from Bangladesh. After crossing Ferry from "Mawa" you have to cross the "Arial Khan" Bridge to connect with southern portion of the country. 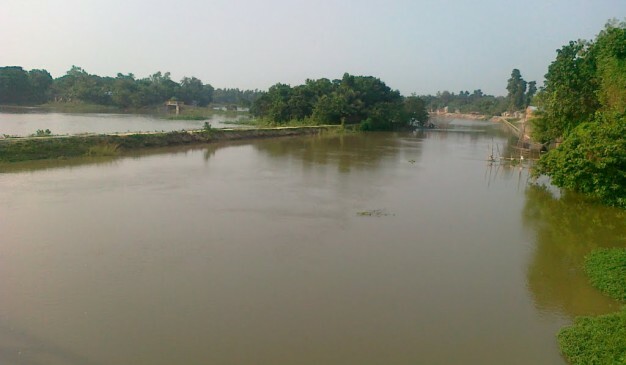 Also, just near from the district Madaripur, there is a Ferry over "Arial Khan" to connect with another district Sariatpur. 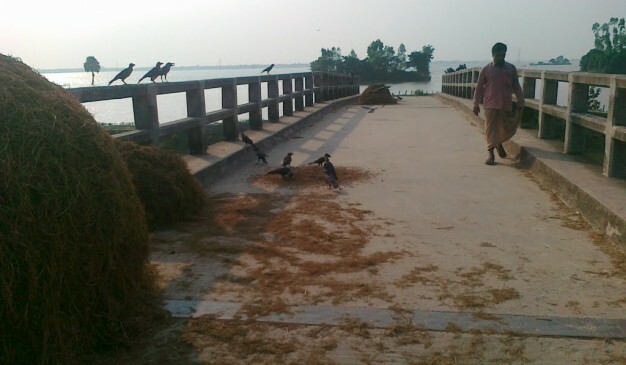 Balashi Ghat (বালাসী ঘাট) is one of the most beautiful tourist spots of Gaibandha District.It stands beside the bank of Jamuna River and is not very far from Gaibandha Sadar Upazila. At the beginning of 2004, steamers were banned from this place. Although, trawlers & boats are available for traveling. It has built a connection with the southern districts of Jamalpur. As a result of erosion, everyday many parts of this Ghat are drowning under the river. A huge crowd comes to Balashi Ghat to enjoy its stunning natural beauty. 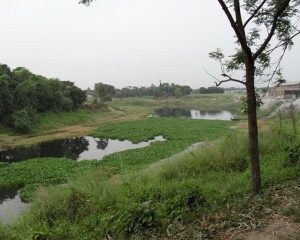 A few kilometers west from the Dhamrai Bazar, there is a river beside the road which is called "Bongshi". It is almost covered by the deadly hyacinths. There is no flow at the river, and at your first look, you'll feel like it as a canal. The color of the water is kind of blackish. It can be due to the hyacinth, or due to the waste dumping from the factories nearby. Whatever the case is, you should not show any audacity to touch the water. The authority haven’t take any steps to keep the rivers (like Bongshi) alive.